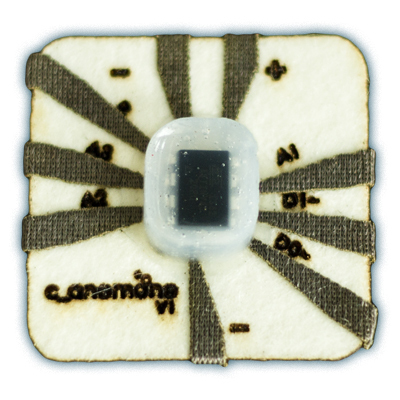 c_anemone is a line of flexible, washable, handmade circuit boards designed to be used in wearable electronic projects. c_anemone is inspired by sea creatures that gather together to form larger, integrated colonies called siphonophores. c_anemone is designed and created by Marisa Ranalli. This is the c_anemone microcontroller, aka the brain. 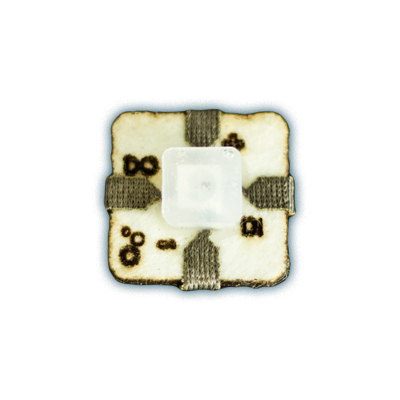 The c_anemone has 5 programmable pins, 3 analog and 2 digital PWM (pulse-width modulation) pins. One more PWN pin (A2) can be programmed through software. 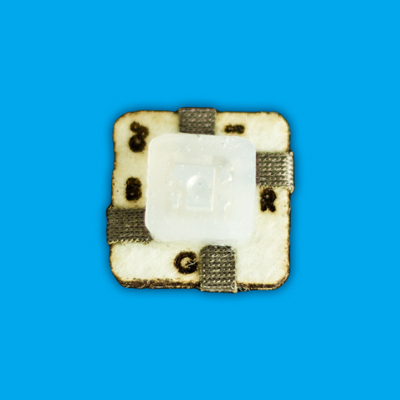 The R pin is used strictly for uploading data to the chip. Make sure that you don't plug the board in backwards, reversing the voltage pins will likely break the board. The c_anemone runs off of an ATtiny45. This is the c_anemone rainbow LED (light-emitting diode). You can program a microcontroller to pass different colour values to this board to get a rainbow of possible colours. This is the c_anemone rainbow pixel. You can program a microcontroller to pass different colour values to this board to get a rainbow of possible colours. 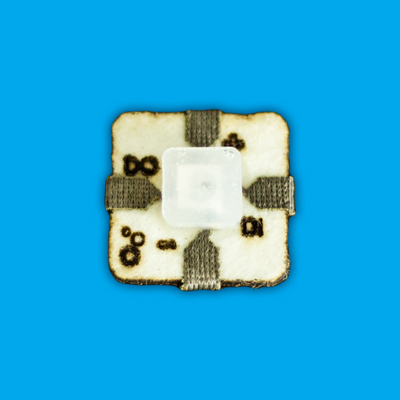 These boards are chainable and individually addressable. This is the c_anemone muscle wire board, responsible for movement. Where can I buy c_anemone products? You can purchase them through our Online Shop. They will available for purchase at the Site Bee Pop Up Shop from May 25th until July 25th, 2014. Site Bee is located at 1550 Queen St. W in Toronto, Ontario. What is the board made out of? The board is made from wool and conductive fabric. If you are allergic to wool, then this board may not be for you. How do I program the microcontroller? The microcontroller can be programmed through the Arduino IDE. 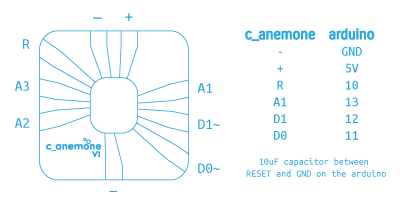 Click here to download the hardware library for the c_anemone. Downloading this library will allow you to program the c_anemone using the pin labels marked on the board. To install the library, locate your Arduino sketchbook folder. This folder is called Arduino and should be located within your Documents folder. If it doesn't exist already, create a folder called hardware. Unzip the c_anemone library to this folder. Further instructions about how to upload sketches can be found here. I am getting errors in the Arduino IDE about defining PAGEL and BS2 signals. You don't have to worry about these, if these are the only errors you are getting. As long as it says your sketch was uploaded successfully, then it is fine. I am getting errors in the Arduino IDE about an invalid device signature. If you get this error, you either have the board hooked up incorrectly to the programmer, or the board is dead. Check your connections and try again. Make sure you have the correct board selected. How do I control the muscle/rainbow LED/rainbow pixel boards? Sketches can be written through the Arduino IDE and then uploaded to the c_anemone microntroller. Click here to download the software library/examples for these boards. To install the library, locate your Arduino sketchbook folder. This folder is called Arduino and should be located within your Documents folder. If it doesn't exist already, create a folder called libraries. Unzip the file to this folder. Can I wash the c_anemone boards? Yes! You can wash the boards in a washing machine, or by hand. Make sure to remove any batteries before washing. What is the best way to attach my board to fabric? We suggest sewing a border inside the board with thread. 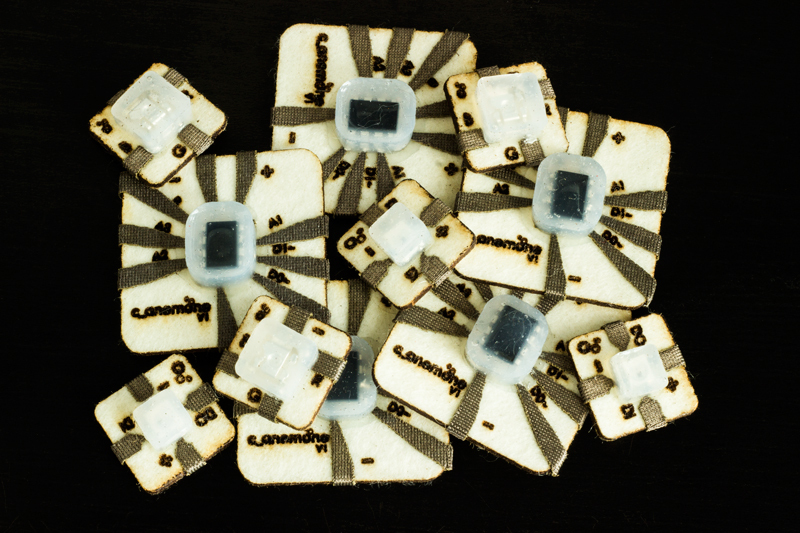 This way, the conductive contacts stay sewn down. You will want to make sure that the boards are very well secured to the fabric, especially if you plan on washing them. My board doesn't look exactly like the board on the site. Why is that? Each board is handmade and therefore unique. 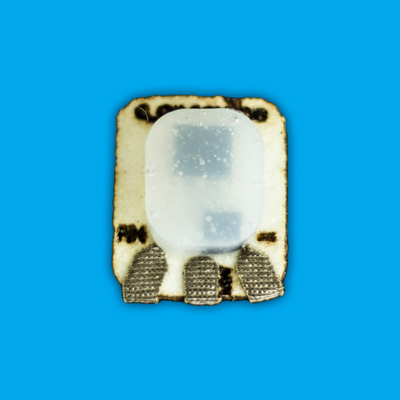 The board measurements vary slightly, and the conductive bits are not always aligned in the same position on each board. The boards are also laser cut, so there will be some burnt parts around the edge of the boards. The burn marks fade with washing. If you have any issues with your board, please let us know. I have a question. How can I get in contact with you? Send an email over to c@anemone.io! You can also find us on Twitter, Facebook, and Google+. 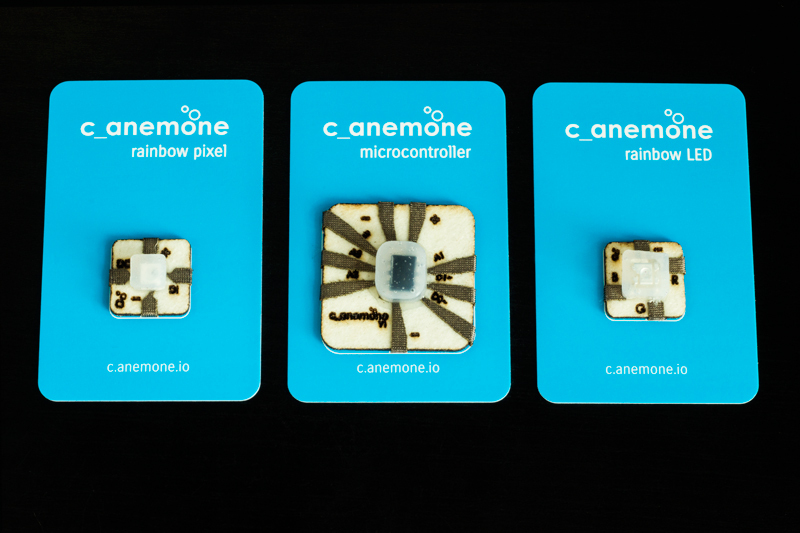 c_anemone circuit boards will be available for purchase at the Site Bee Pop Up Shop from May 25th until July 25th. Site Bee is located at 1550 Queen St. W in Toronto, Ontario. Click here to see an interview from Digifest with Marisa Ranalli. c_anemone will be at the Toronto Digifest. More details available here. Your order has been placed! You should receive an email shortly with your payment details. Your card will be charged $0.00 CAD. In order to upload your sketch to the c_anemone, you will need a second Arduino, some alligator clips and wires, and the Arduino IDE. You will want to download the c_anemone hardware library. Locate your Arduino sketchbook folder. This folder is called Arduino and should be located within your Documents folder. If it doesn't exist already, create a folder called hardware. Unzip the c_anemone library to this folder. Open the Arduino program. Under Tools > Board select c_anemone. You will also want to set the Arduino as a programmer. You can do that by selecting Tools > Programmer > Arduino as ISP. Follow the diagram above to hook up the c_anemone to your Arduino. Click on the upload button to upload your sketch. The muscle board has 3 different pins, PIN, MW, and —. PIN needs to be connected to a PWM (pulse width modulation) pin on your microcontroller. 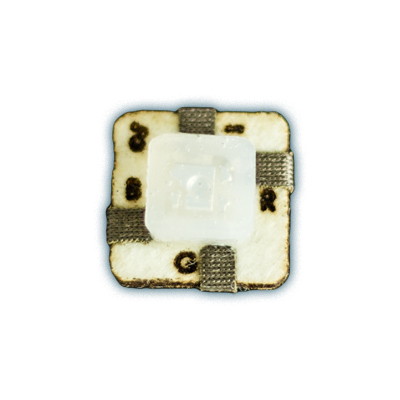 These are indicated by the ~ sign on the c_anemone microcontroller. The MW pin needs to be connected to your muscle wire, with the other end of the muscle wire going to the positive side of your power source. The — pin should go to ground of your power source. The program on your microcontroller should be using analogWrite() to send data to the pin, to ensure that the muscle wire doesn't burn out from being over-powered. If you are sewing with conductive thread, make sure to use a very conductive thread. Threads with higher resistivity will have a harder time activating the muscle wire. Download and add the following library to your Arduino environment to see an example sketch. The rainbow LED board has 4 different pins, —, R (red), G (green), and B (blue). The — pin should go to ground of your power source/microcontroller. The other pins need to be connected to PWM (pulse width modulation) pins on your microcontroller. These are indicated by the ~ sign on the c_anemone microcontroller. There are only two PWM pins labeled on the c_anemone microcontroller (D0 and D1), but the A2 pin can be made into a PWM pin through software. The rainbow pixel board has 4 different pins, —, +, DO (output), and DI (input). The + pin should go to positive of your power source/microcontroller. The DI pin should connect to a pin on your microcontroller. Rainbow pixel boards can be chained together and individually programmed. To chain them, connect the DO pin to the DI pin of the next board. Download and add the following library to your Arduino environment to see an example sketch. The example uses the light_ws2812 library.